Get improved handling and reduced wheel hop while maintaining a comfortable ride with the CorkSport Passenger Side Motor Mount for your Mazdaspeed 3. Designed as a direct OEM replacement, the CorkSport Mazdaspeed 3 Passenger Side Motor Mount maintains OEM fitment while adding a much stronger base incorporating stiffer urethane bushings and a billet aluminum structure. Warning: This product is a much more solid mount than the OEM mount and can transmit significantly more NVH (noise, vibration and harshness) into the passenger compartment. You may find the NVH unsuitable for daily driving, please consider this carefully before purchasing. Black anodized finish with zinc coated sleeves for a durable, lasting finish and long life. Disclaimer: NVH (noise, vibration and harshness) is heightened. You may find the NVH unsuitable for daily driving. Some customers report that changing your Transmission Fluid can help significantly. So NVH is definatly up their, all my mirrors we unusable for about the first 3-400 miles or so but it made for a nice massage. I do have the RMM as well and I did feel torque steer drop down a bit. Also shifting aggressively I dont feel as much of a jolt from the engine as before. I'm about 900 miles in and the noise is dying down except for when you lightly accelerate at 2-3k rpm but it seems to be going away steadily. A friend actually asked if I had nodded the exhaust (still fully stock) because the car was louder, I took it as praise haha and explained it was the mount. 10/10 would buy again. Install is easy too. This definitely reduced torque steer when coupled with the stage II RMM and NVH wasn't too bad after settling. I rechecked the bolts 1k miles later to ensure they were still torqued to spec (they were) and found the bottom rubber bushing closest to the firewall hanging 1/2 way out and torn. I don't know if this will be an issue, but I'm betting it will 5-10k miles later when that bushing is gone and the mount is metal to metal. I've always liked Corksport, but for $229 this is really disappointing. There are plenty of aftermarket motor mounts out there for the Speed 3 and it left me wondering if I should have gone with another brand. This mount is a beast! Will transmit a large amount of noise into the cabin and is quite a shock initially. Can literally hear everything coming from the engine on the passenger side as well as the exhaust plus anything that can rattle...will. For a daily driver I would not recommend unless you're like a honey badger and just DGAF but is fantastic for a track/strip car with lighter street use. Definitely an excellent made product and performs as advertised while looking 10x better under the hood than the stock one. Would recommend for the bold and those who quest for more power. Hi does this item fit to a mazda 3 2.3L hatchback 2004 with motor upgrade? This is a great mount! Little to no torque steer and better power to the ground! The bad! There is a lot of noise when windows are up but fine when windows are down. Looks like the mount amplifies everything 10 folds from engine to exhaust. I mean everything! I installed all 3 CS mounts! There is no middle here. It's u want quite or u want performance! One has to give! Top Quality part and fast service. Very well made pretty easy to install. The NVH is loud but it still needs to break in( i hope it lowers it a little). What is amazing is the way the car feels more responsive and the power gets put down off at launch. Thanks. will this fit 2007-2009 mazdaspeed 3? UPDATE: I have had this mount in for about 300 miles and vibrations went down considerably. In colder weather it will vibrate more but when its warm all you should notice is a slight increase in vibration compared to stock and noise from the engine will stay about the same. An awesome product for those that want to get rid of that rubber oem mount. Be prepared for a lot more engine noise, and vibration, car shifts much better and seems to drive better but the vibrations will make this car be a lot louder. I just upgraded to this along with the race rear mount so I'm sure a lot of this is noise that will go away with breaking in. We have not fitted the mount with other models of the Mazda 3 yet. We have several customer who have though. This mount is a good looking piece no doubt.. NVH is pretty comparable to most other PMM's on the market, but its still more than what I would want to deal with on a daily basis. 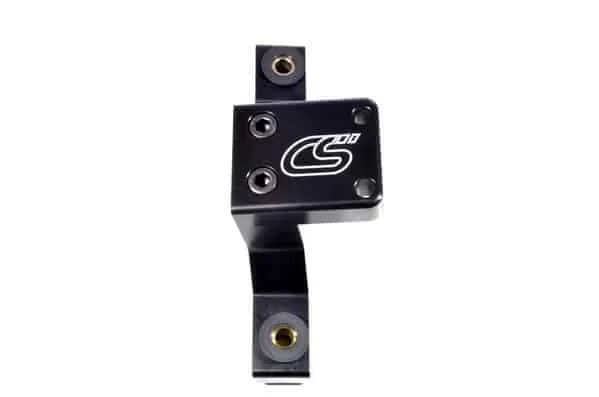 Corksport please design something that is similar to the stock mount with a better bushing for us daily drivers that don't want to sacrifice to much comfort for better performance . CorkSport Reply: We found the 80s were really tough to install for most people. Will this mount work for the Mazdaspeed6? Can this mount be used with transmission mount and rear mount still stock? You could but we recommend upgrading the rear mount first. Will this work with skyactiv engine? Do you sell replacement inserts for this mount? I think mine might be wearing out. If not what are the specs so I can find some. Thanks. We do not. I don't think anyone makes an insert that would fit our upgraded mount. Does this work with the Mazda3, specifically 2.3L engine? This question has been previously asked twice, with conflicting answers. And it also doesn't specify whether it was on a 2.3L or a 2.0L as those two different engines use different mounts. The Mazdaspeed 2.3 yes. We have not tried the mount ourselves on the non turbo 2.3. Will this work on an 08 Mazda 3 Bk (1st gen) with the MZR L3N5 2.3L engine? I already have the race rear mount installed and I want to make sure this will work since my stock #3 mount was noted by the dealership as needing to be replaced (before I installed the new rmm). I know nvh will be increased initially and then go down a bit after it's broken in. It will not work with a standard Mazda 3, it only mounts to the Mazdaspeed 3 engines. We have had customer use this mount on the Mazda 3. We have not done a test fit in house to confirm the fitment.